This year, in partnership with Launceston LINC, the Tamar Valley Peace Trust invited School students to make a promise to Peace; to write a message or draw an image of what Peace means to them. Displayed in the ground floor window of Launceston LINC from Monday 30 July until the end of August 2018. This year, in partnership with Launceston LINC, the Tamar Valley Peace Trust invites School students to make a promise to Peace; to write a message or draw an image of what Peace means to them. 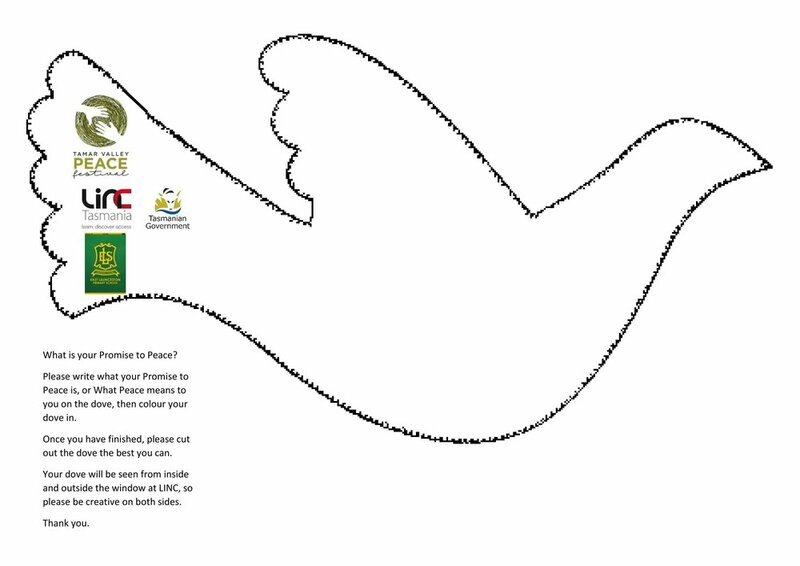 We have created a Peace Dove template (attached) on which students can write a message or create an image. Once students have finished being creative with their Peace dove and cut them out, Attach to some string to create a bunting for your class and we will hang them in the window at Launceston LINC. Discuss Peace in class – could be as simple as reading a book. Encourage student’s to express what peace means to them by writing or drawing on both sides of the dove (as they will be displayed on glass and seen from both sides). Ask students to cut out the dove. Attach your work to string to create bunting. Please email coordinator@tamarvalleypeacefestival.com if you would like your School dove as a PDF and would like more information. We have placed your School’s logo on the Dove as a way of demonstrating your organisation or school’s role in helping ‘teach’ Peace. Or you may use the Dove with no school logos. Due to student privacy and the public location of the final works it is an individual choice regarding the inclusion of the student’s name. We look forward to seeing the wonderful doves that the students create. They will be displayed in the ground floor window of Launceston LINC from Monday 30th July until the end of August 2018. We urge you to engage your students in this process and a discussion about peace – and the concept of non-violent conflict resolution. Students may define peace in a range of ways – maybe the absence of bullying, war or domestic violence – or greater cultural or environmental harmony. The lens they use does not matter: the goal is to think about how they, as individuals, can help create a kinder society. This message so aptly supports the Education Department’s recently launched Respectful Schools: Respectful Behavior paper. The Philosophy Café is a regular opportunity for members of the Launceston community to meet and discuss, in some depth, a philosophical topic of their own choosing. The Café is hosted by philosophers from the University of Tasmania as part of its commitment to ongoing intellectual engagement with the broader Tasmanian community. As part of the Tamar Peace Festival the Philosophy Café will consider the question: when is peace wrong? Description: Come-and-go-as-you-like contemplative experience with live instrumental music and periods of silence in a beautiful building. Description: Songs of Peace at Pilgrim with a simple afternoon tea. COMMUNITY KITCHEN - The Filipino women's group. Drinks will be available at the adjoining bar. VENERABLE LAMA SAMTEN WEEKEND TEACHINGS - DAY 2 Coping with Loss & Grief. from a Buddhist perspective. The word "loss" can mean many things. People say I have lost my mind; I have lost my wallet, or my job; I have lost my wife or husband; I have lost my country etc. These general expressions, they mean you are not able to find whatever it is you are looking for and could be quite mild on an emotional level. However loss can also mean death: natural death or premature death. This is stronger, however both contain grief. Grief literally means the suffering of parting of separating. We don't like change, we don't like parting - we like meeting. the suffering of parting or separating these days is quite common: explosions, airplanes accidents, and other unexpected tragedies. Venerable Lama Samten will explain how to deal with loss or grief. Please bring a plate of vegetarian food for a shared lunch. Image from 2016 Festival. by Megan Casey. Join us to pray for peace around the world and to worship the Prince of Peace, Jesus Christ. Please join us for a free meal for street people. The Welcome Dinner will be held at UTAS , 6pm-9pm on Saturday 29 July. Consider arriving early and engage with the Human Library. The Launceston Human Library invites you to come and spend 20mns of peaceful conversation with someone in our community you have not met before. The Launceston Human Library program was awarded a Tasmanian Human Rights Award in 2014. It brings in to Launceston a methodology developed worldwide which aims at building a positive framework for conversations that can challenge stereotypes and prejudices through dialogue. The Human Library is a place where real people (from our community) are on loan to readers (you). A place where difficult questions are expected, appreciated and answered. Come at 5pm and allow time for a couple of 20mns conversations. So far, we have the following Human Books – there may be a few other titles as well, which we will confirm closer to the date. · The CARDS I WAS DEALT,- Life is like a game of cards. You can't choose what you're dealt but you can decide how to play them. · CLIMBING MOUNT KILIMANJARO, 1969 - Both a physical and a cultural adventure! · DISABILITY CAN’T STOP ME I am able to live independently, partly because my parents never gave up on me. · MAKING AUSTRALIA MY NEW HOME - I came from Germany to Australia in 1952, to work on the Trevallyn Hydro scheme, and later worked as an Ansett employee. I have had varied life experiences. · The VALLEY OF SEARCH - “The stages that mark the wayfarer’s journey are said to be seven”. My spiritual journeying began with agnosticism and ended with Baha’i. On the way I passed through strange “valleys”. Note: Anyone can walk in and meet a Human Book (no bookings needed) … but if you are staying for the Welcome Dinner, you MUST BOOK ahead. The program is an initiative of the City of Launceston. An opportunity for women of all ages, nationalities and cultures to come together and dance. There will be disco, Persian music, polka, belly dancing, Macarena and who knows what else? Dance experience is not necessary, but enthusiasm is! Event Description: Open mic format, probably over a couple of brackets of readings. Come along and read your own work, or a poem you like that illustrates or suggests peace or associated themes. wheelchair access: Not for the room upstairs that we are using for this event. Brahma Kumaris Australia is part of a worldwide organisation that is dedicated to helping people to bring into their daily lives their most positive energy and deepest personal values. To do this, we teach Raja Yoga Meditation as a community service. Internationally Brahma Kumaris is affiliated with the UN as a non-government organisation with consultative status. It has been the recipient of seven Peace Messenger Awards from the UN. Event Type: Interactive class teaching the simple technique of Raja Yoga Meditation. Event Description: Through Raja Yoga Meditation we learn to make our mind our best friend and harness its power. This brings about newness in the way we think about ourselves and the world we live in. Mindfulness in Tibetan is DEN SHI. or BAK YAOD. DEN means remembering. SHI means knowing. BAK means vigilance. YOAD means to have. This practice is with your body, speech and mind. with being mindful you can sit, come, go and do things. But meditation is much deeper than this. Venerable Lama Samten will spend the day explaining the difference, interspersed with short mediation practice sessions together. Image from TBUG FB page. Is there a better way to feel relaxed and in harmony with your body, bike and your community than a gentle and steady ride around Launceston’s off road bike trails? Join us for a contemplation of how calm and beautiful life in Launceston can be, especially on a bike. We will start at Park St Royal Park and include some time for contemplation at the Peace Garden opened in honour of former Governor Peter Underwood in 2016. Everybody is welcome but it is not a learn to ride event. You don’t have to be an Olympic rider but you must be able to ride independently. The ride will be organised by TBUG qualified ride leaders. Event: Students will be given the opportunity to be transported to and form the Harvest Market., from the Newham Campus. Description: Students will be given the opportunity to be transported to and form the Harvest Market., from the Newham Campus. Venue: Utas Newham campus/Harvest MArket. We are calling out to Cycling groups in Launceston to be involved in this year’s Tamar Valley Peace Festival. Our idea was to encourage cycling groups to start at a given point that suits them, but to conclude at Harvest Market. With this ride to take place between 8:30am and 12pm on Saturday the 29th of July 2017. The intention was not to make more work for any one, but to open up conversations between organisations, promote leadership in peace and to suggest a common finishing location for cycling groups during the Festival weekend. One key area of the Festival is to engage community groups in demonstrating, on their own terms, what peace means to them – and the role that their organisation takes in teaching and promoting peace and goodwill. Whilst it is a free event the booking system helps the event organiser keep track of numbers as there are limited seats - so please book your seat if you are coming. Event Description: We hear a lot about freedom of speech, freedom of religion and freedom from discrimination. But, really, how well are the rights and freedoms of Tasmanians protected? And what about the right to an education, adequate housing and a clean environment? What happens if one person’s rights conflict with those of another’s? Why do some states have a Human Rights Act and others (like Tasmania) do not? Come and hear from a distinguished panel about why we need a Human Rights Act and how it can contribute to building the fair and prosperous future we want for all Tasmanians. Robin Banks was Tasmania’s Anti-Discrimination Commissioner from 2010 to 2017. She has extensive experience working for the human rights of people with disability, young people, Aboriginal people and Torres Strait Islanders, and people experiencing homelessness. Kristen Desmond is the mother of three children with disability. 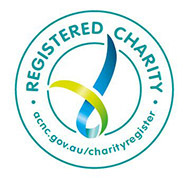 She is the former Chair of the national peak body Children and Young People with Disability Australia (CYDA). She founded the Tasmanian Disability Education Reform Lobby and is a former Senior Vice President of Autism Tasmania. She is currently a member of the Tasmanian Education Inclusion Advisory Group – Disability Focus and was a former member of both the Tasmanian Ministerial Taskforce for Improved Support for Children with Disability and the Tasmanian Government’s Autism Advisory Panel. Kristen was named Launceston City Council’s 2016 Citizen of the Year and was a Tasmanian State Finalist in the 2014 Australian of the Year Awards. Rodney Croome AM is a long-time LGBTI human rights advocate in Tasmania, nationally and internationally. He is the former national director of Australian Marriage Equality. Rodney fronted the successful campaign in the 1990s to decriminalise homosexuality in Tasmania. He is the author of 'From This Day Forward: Marriage Equality in Australia' (Walleah Press). Rodney was named 2015 Tasmanian of the Year. Rajan Venkataraman is a Member of the Board of Civil Liberties Australia. For twenty years, he worked with the Australian public service as a policy adviser on international relations and national security . He also served as an Australian diplomat and trade negotiator. Rajan volunteers as a tutor with 26TEN, Tasmania’s adult literacy and numeracy program. During the event representatives from the Human Rights Week Committee will be giving a short speech to promote the awards and encourage nominations. There are nine categories recognising outstanding contributions by Tasmanians including School, Print Journalism, Individual, Youth, Organisation, Multicultural, Sport, Mental Health and LGBTI cultural awareness. During the event "WHY TASMANIA NEEDS A HUMAN RIGHTS ACT" (click on wording and event will open in a new page) representatives from the Human Rights Week Committee will be giving a short speech to promote the awards and encourage nominations.